My. 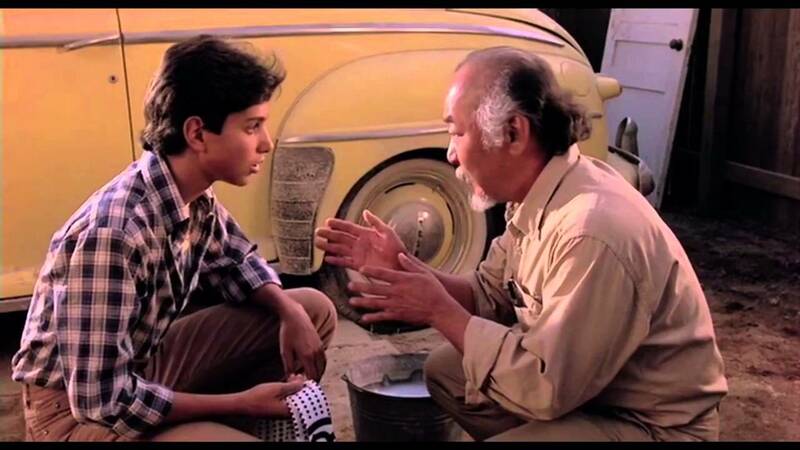 Miyagi imparting life lessons to Daniel. Karate is the means, life is the lesson. When The Karate Kid came out in 1984 I knew nothing about martial arts. I loved the movie and was very impressed with the cool karate techniques and beating up the bad guys. The movie was the best thing that ever happened to karate schools as students lined up to register for lessons. That was a long time ago. Since then I have learned that the actor playing Mr. Miyagi, the late great Pat Morita, (Noriyuki Morita), in fact was not a martial artist, the techniques used were very simple and not really that realistic or effective and the true lesson of the movie was not what I thought it was. Looking back I find the techniques almost comical. And the idea of learning karate to beat up the bad guys just doesn't make sense here. Daniel was in fact a hot headed kid who could have ended the entire episode by just letting it go. Time after time he gets into trouble which was entirely avoidable. The true lesson, in my opinion, is the relationship between Mr. Miyagi and his student Daniel, as well as the interaction between Miyagi and the teacher of the Kobra Kai, Sensei John Kreese. Miyagi is teaching both that karate is only valuable if is it used for the correct purpose; self defense, self respect. All fights must be avoided if at all possible. We must never seek a fight. Fighting for a "plastic man on top of a piece of marble" is not a reason to fight. Daniel is an angry teenager. He is being raised by a struggling single mom. He has just been uprooted from his home in New Jersey, leaving behind all his friends and everything he knows. As he says, "I don't know the rules here in California". His family is poor and he lacks confidence. He is heading for trouble. The true gift of Mr. Miyagi is in taking in a troubled youth, using martial arts as a way to reach him and teach him, guiding him with life wisdom. Miyagi himself is old and alone. He lost the one true love of his life and his child years ago. His sadness is deep inside him. As much as the student needs the teacher, the teacher needs the student. Miyagi knows when to be soft and when to be hard, when to be strict and when to let go. He is the true teacher. The movie is not about fighting, the movie is not about being tough and ruthless, the movie is about learning to cope with life and the difficult situations that come our way. One day life makes sense and the next day it all falls apart and nothing makes sense any longer.